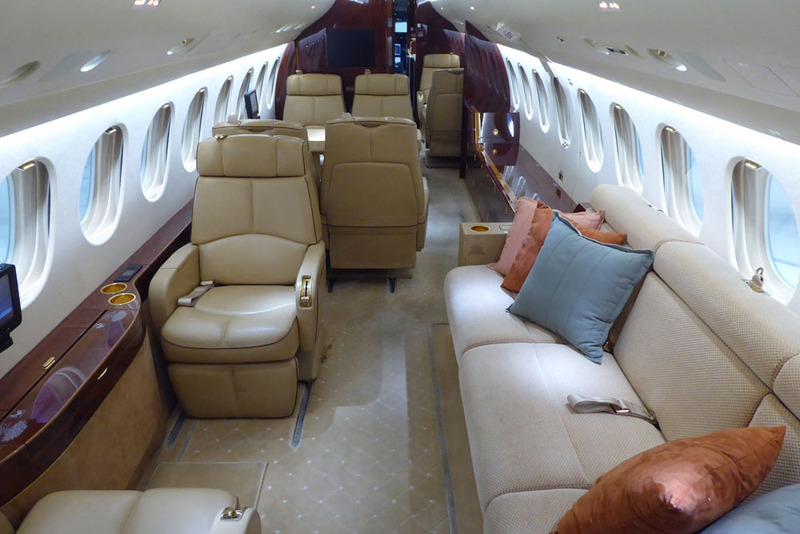 This outstanding aircraft is based in Boise, Idaho and may be viewed by appointment. 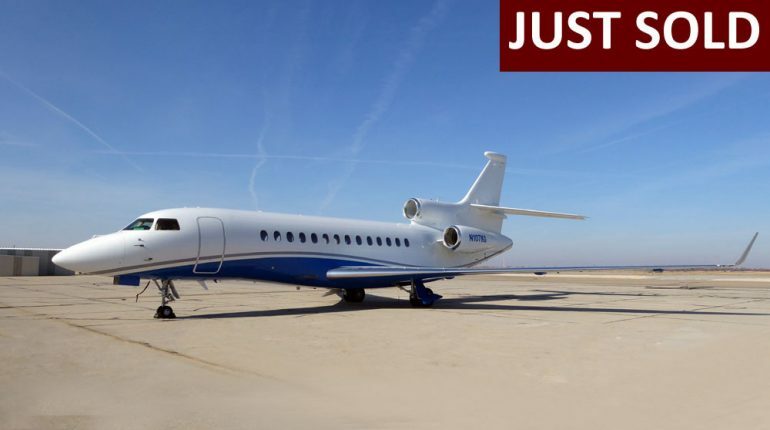 This spacious interior accommodates up to thirteen passengers in three seating areas and is configured with a large forward galley, forward and aft lavatories, and an in-flight accessible baggage compartment. 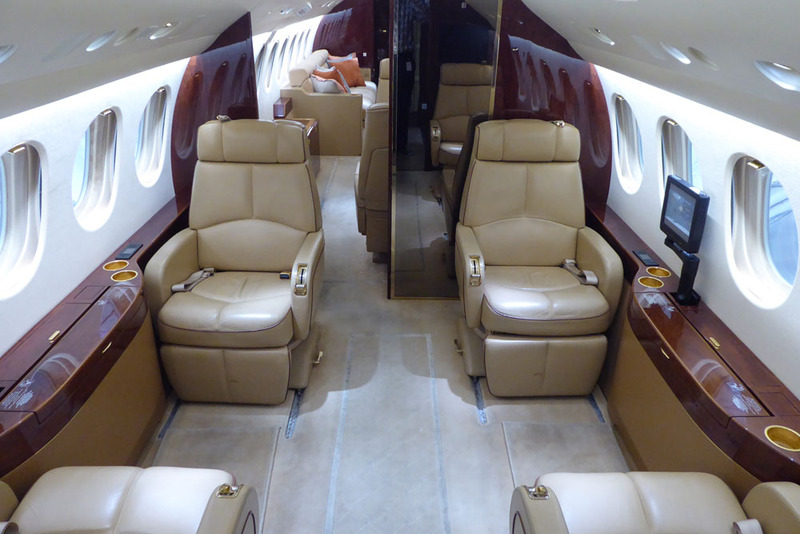 The cabin seating consists of a forward double club, a mid-cabin left-hand four-place dining group opposite a credenza, and an aft left-hand two-place club opposite a three-place divan. The forward cabin’s forward-facing seats feature manually-controlled recliner style leg rests, and all four seats have electric lumbar and increased seat height with winged headrests and berthing. The dining group double seats feature electrically-controlled lumbar, tilt and recline functions, increased seat height, and winged headrests. 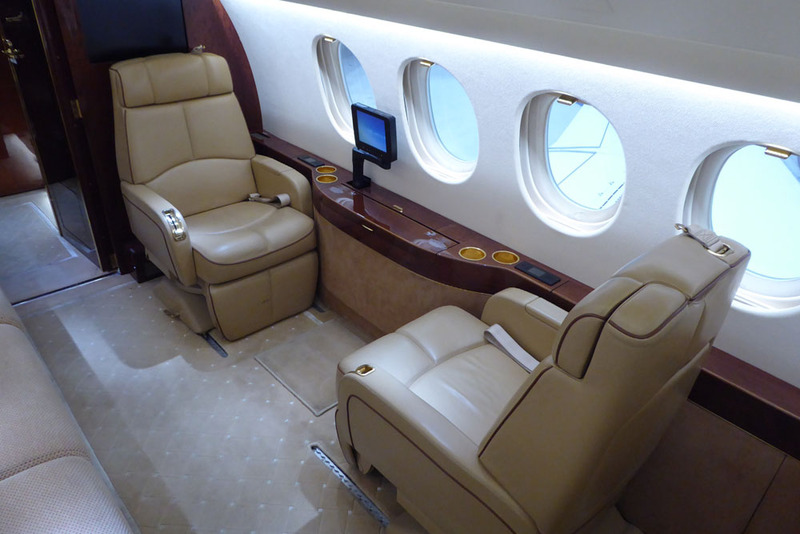 The aft cabin club seats are equipped with electrically-controlled recliner style leg rests, tilt and recline, as well as increased seat height with winged headrests, and berthing. The 80” divan features electrically-controlled berthing. A pocket door provides separation between the galley and forward cabin, cabin dividers with an electric roller curtain separates the forward and mid-cabins, and the aft lavatory features a hinged door. 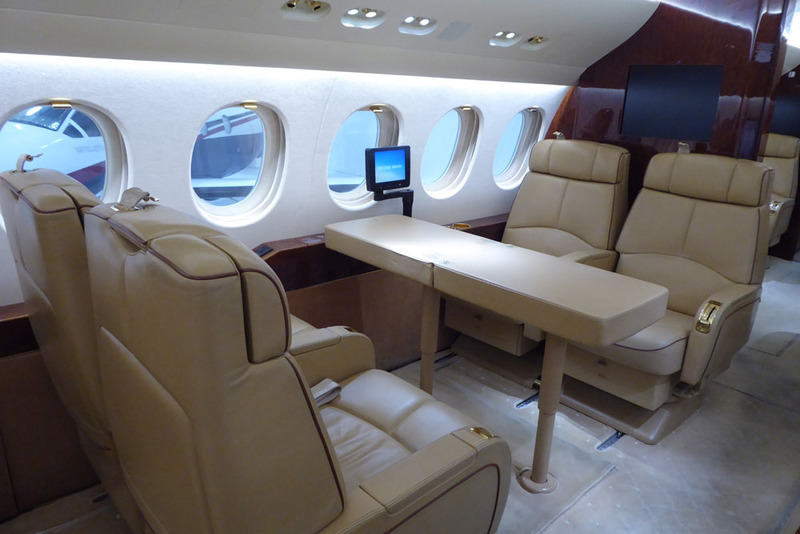 Console tables are located at each pair of individual cabin seats, and the dining table features electric telescoping. There are 230 VAC outlets in various locations throughout the cabin. The Falcon Cabin Management System is complemented by an 8.4” galley LCD touchscreen controller, a cabin audio system, a dual DVD player, three (3) 21” cabin bulkhead LCD monitors, several plug-in LCD monitors, iPod and auxiliary RCS-style interface panels, an external camera system with five cameras, Airshow® 4000, and a Rockwell Collins Tailwind 500® satellite television. 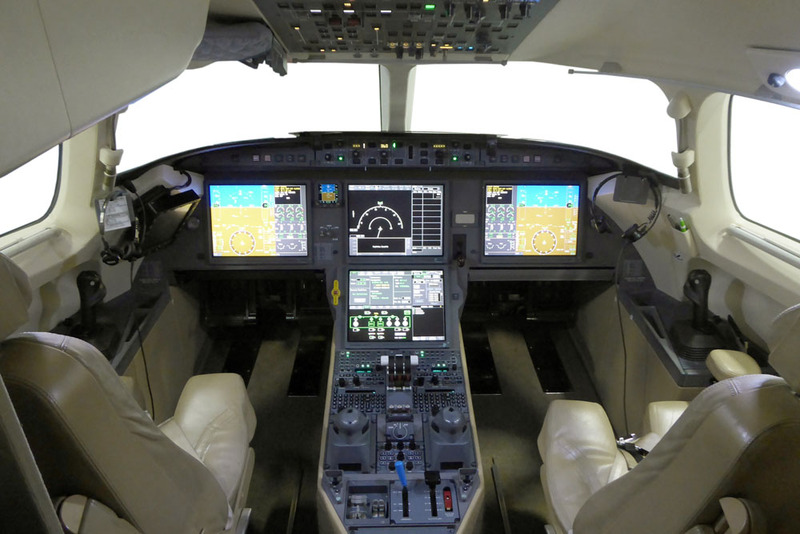 A Honeywell MCS-7120 Inmarsat Satcom system offers satellite voice calling via ICG cockpit and cabin handsets, and internet is available via Honeywell HD-710 SwiftBroadband and Wi-Fi. 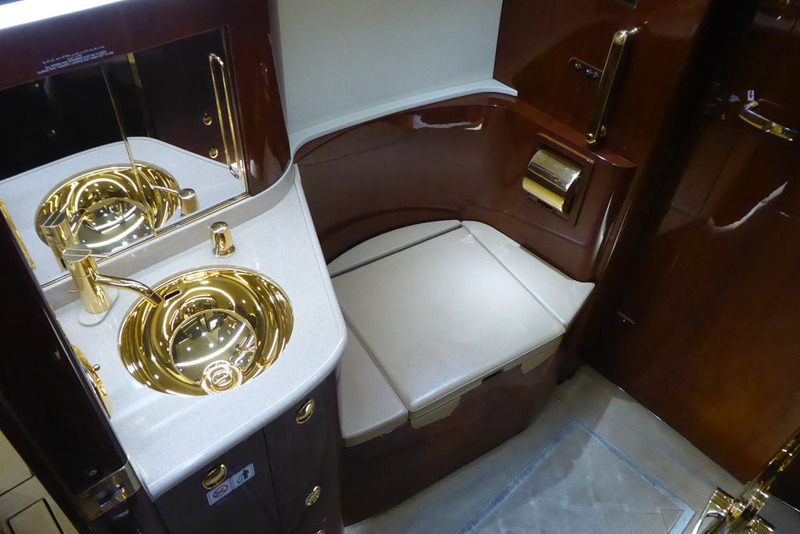 The interior woodwork is finished in “F/C Pommele Mahogany” hi-gloss veneer, the main cabin exposed metal is plated in “Polished Champagne Gold”, and “Basketweave” carpeting is installed in the main cabin. The main cabin headliner is finished in “Sheepskin” Tapisuede, the valence panels are covered in “Almond” Ultraleather™, and the sidewalls are finished in coordinating fabrics. 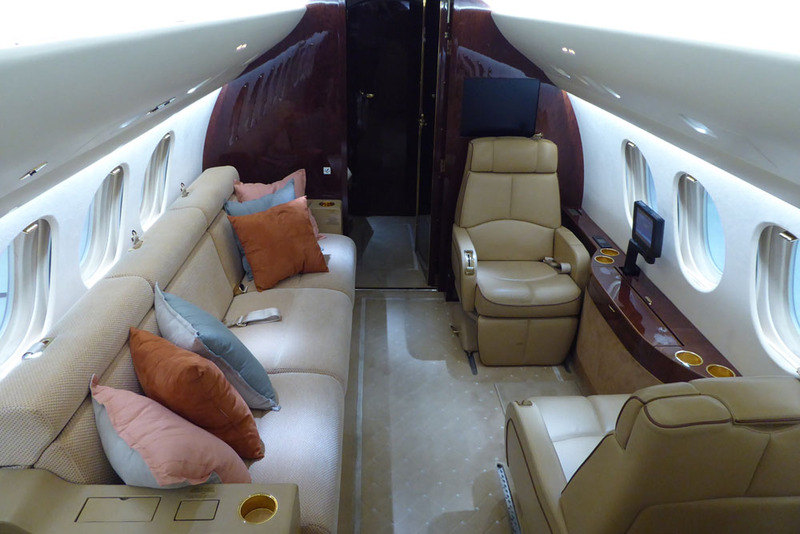 The main cabin single and double seats are covered in “Custom Hickory” leather with “Bourbon” piping, and the divan is finished in “Panama Chenille Tegenaire” fabric. “Mojave” Corian® countertops are installed in the galley and both lavatories. Galley equipment and features include a countertop, two pop-out work surfaces, a sink with faucet, dual ice drawers, an espresso machine, a microwave, and a convection oven. Opposite the galley is an annex providing additional storage, dedicated bus bin/tray storage, and a closet. 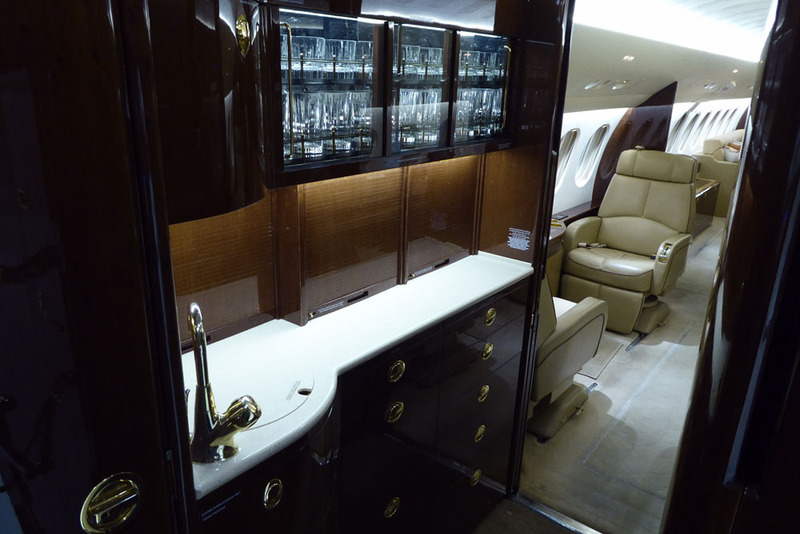 The right-hand forward lavatory features an externally-serviced toilet, and a sink with faucet. 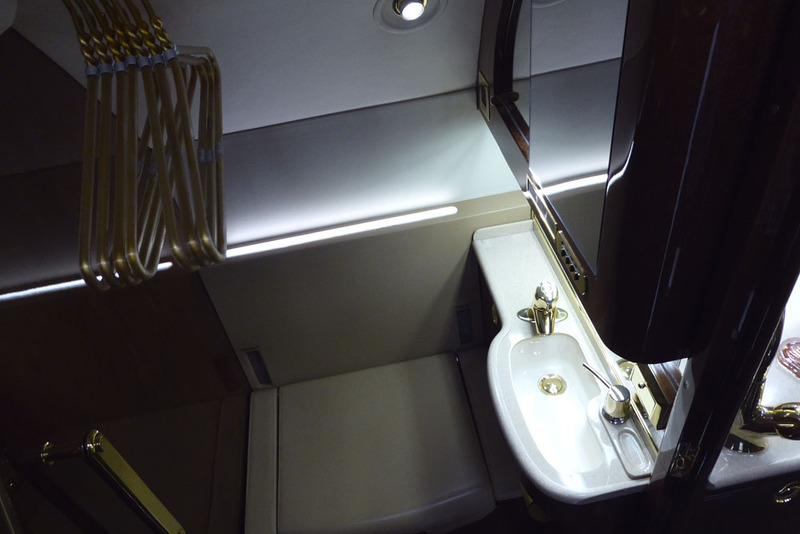 The aft lavatory is equipped with an externally-serviced toilet, a lighted vanity with sink and faucet, and a large closet. 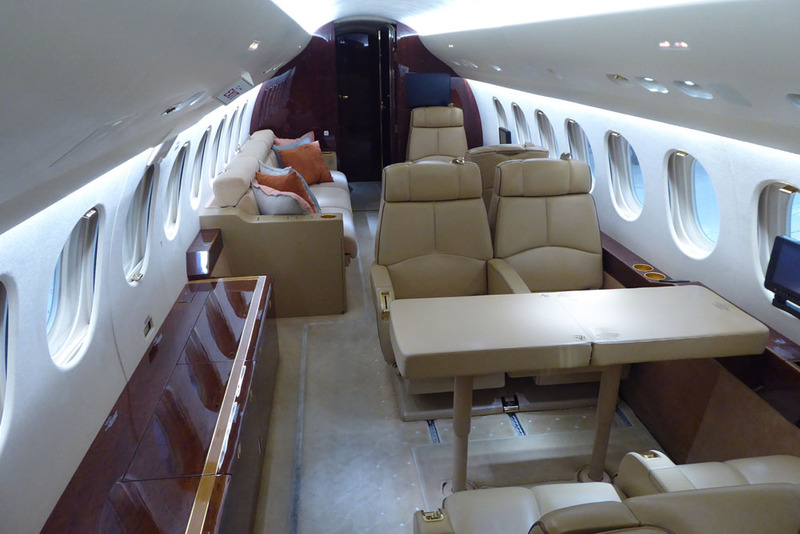 The in-flight accessible baggage compartment features hangar bars and a ground use electric outlet. The upper fuselage and wings are painted white, the lower fuselage and wings are blue, and a gray stripe runs along the both sides of the fuselage, just above the blue.